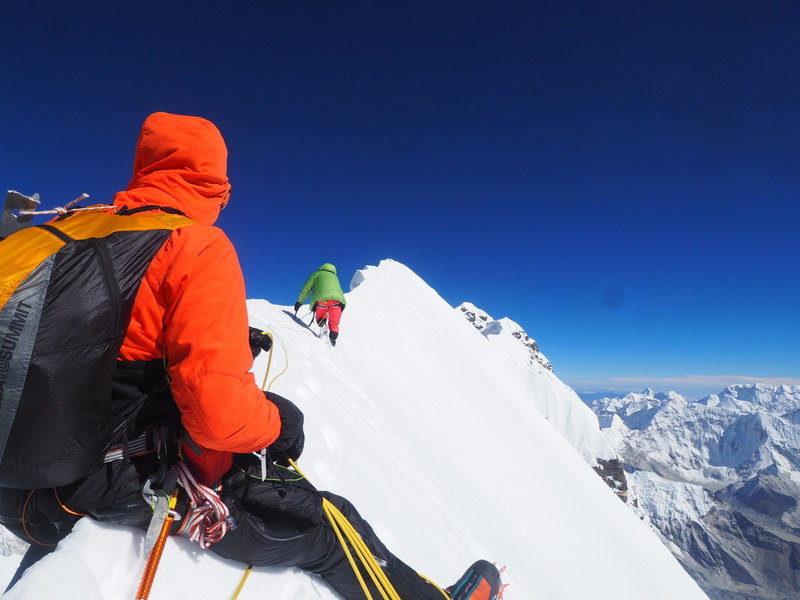 Helias Millerioux, Benjamin Guigonnet and Frederic Degoulet on the summit ridge of Nuptse, en route to completing the first ascent of the South Face (WI6 M5+, 2200m). The climb was selected for a Piolet d'Or. Out of 58 climbs on the list of "significant ascents" in 2017, the Piolets d'Or committee has announced three climbs and two special mentions to be recognized at the upcoming 2018 award ceremony, which will be held outside of France—at the Ladek Film Festival in Poland—for the first time in the ceremony's history. The event is scheduled for September 20-23. In modern mountaineering, questions of style and means of ascent take precedence over reaching the objective itself. It is no longer a matter of employing huge financial and technical resources... The Piolets d'Or throw the spotlight on imaginative and innovative new routes, using a minimum amount of equipment, and building on experience. Satisfaction...is probably the last logical line on the huge west face of Gasherbrum I. It is the first full ascent of the face, and completes a direct line to the summit first attempted back in 1983 by Jerzy Kukuczka and Voytek Kurtyka. Holecek had made four previous attempts on this line, in the process losing one climbing partner and parts of several toes. The successful ascent, beginning on July 25, took six days, with the last bivouac at 8000 meters. The final rockband above 7800 meters had presented such a high order of technical climbing that it took a full 12 hours to complete just 80 meters. The descent from the summit, via the Normal Route along the Japanese Couloir, was first through a white inferno, then down avalanche-prone slopes. They returned to base camp eight days after leaving. The beauty of this coveted line, the full commitment of a difficult alpine-style ascent followed by a traverse of the mountain, and the fact that it was the first ascent of the face, makes Shukriya on the northeast face of Shispare a masterpiece of modern high-altitude climbing. Beginning in 2007, Kazuya Hiraide (Japan) attempted Shispare three times before 2017, once by the northeast face. For his fourth attempt he teamed with fellow countryman Kenro Nakajima. 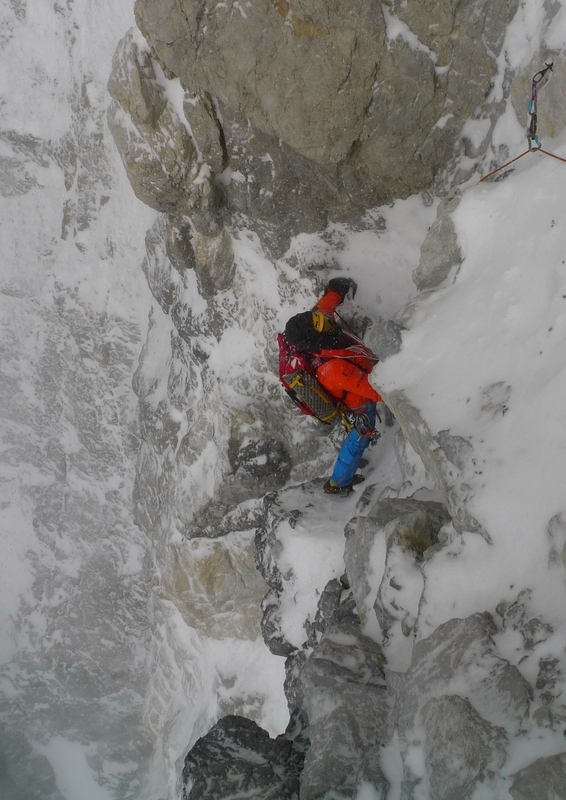 Conditions were poor in the Hunza Valley last August, and the pair battled unstable weather throughout the five-day ascent, experiencing much snowfall and spindrift avalanches. In reaching the summit they had made only the third overall ascent of this elegant, sharp pyramidal peak in the Western Karakoram. The descent of the original 1974 Polish-German route on the northeast ridge and north spur, with complex route finding in bad weather, was certainly no pushover, and two more days were required before the Japanese could regain base camp. The immense south face of Nuptse will always provide a difficult, high-altitude challenge. Even the unrepeated route of the 1961 first ascent is widely regarded as one of the first, if not the first, technical big faces climbed in the Himalaya. Benjamin Guigonnet and Helias Millerioux tried a new line on the left side of the face in 2015 and '16. On their second attempt they were accompanied by Frederic Degoulet, reaching 7400 meters before bailing. Tenacity paid off in 2017, when all three Frenchmen completed the line and reached the summit of Nuptse Northwest (climbed several times previously from the opposite side). Their route was a bold outing with much steep and difficult terrain. It was committing, not without objective hazards, and required highly technical ice climbing, with at least a dozen pitches of WI5 and above. The climbers bivouacked five times on the ascent and once during the descent (largely by rappel) of their route. This ascent may be destined to gain iconic status in the realm of modern technical Himalayan climbing. The southwest face of shapely Nilkanth (aka Nilkantha, 6596m) in India's Garhwal Himalaya was described in 2000, by the party that made the first ascent of the west ridge, as a "technical super-alpine challenge." Reaching the foot of this face is not straightforward and involves exposure to objective danger. Continuous tricky mixed ground and beautiful steep ice then lead all the way to the summit, 1400 meters above. It was climbed for the first time last autumn with four bivouacs by a three-member American team, which found difficulties up to WI5, M6, A0, and 70-degree snow, the crux high on the wall in an area dubbed the Castle. They named the route Obscured Perception and it hasn't escaped our notice that women formed the majority of this party. The southwest face had been the objective for a couple of expeditions before 2015, when it was the goal of Anne Gilbert Chase and Jason Thompson, [who invited] Caro North [to join them]. 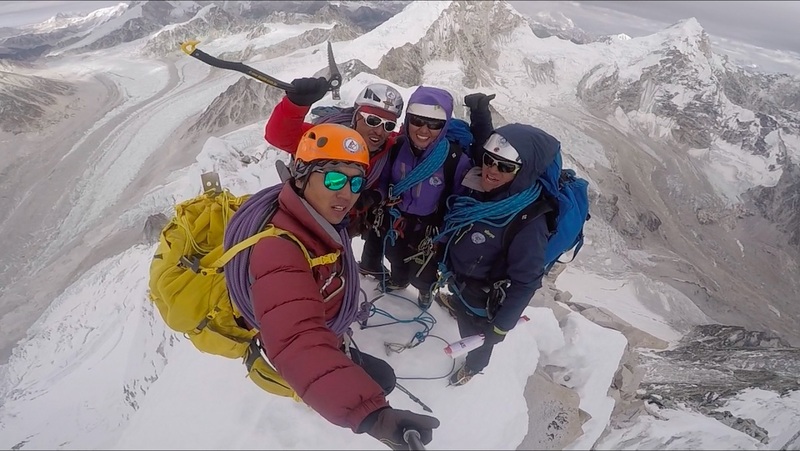 As a preamble to their attempt (which subsequent bad weather did not allow) these three climbed to 6400 meters on the west ridge, which they planned to use for descent. The knowledge gained would prove useful in 2017, when Chase and Thompson decided to return to the mountain. This time Chantel Astorga was recruited as the third member. The three made their final attempt on the southwest face on September 28, reaching the summit on the morning of October 2 and descending the west ridge the same day. While it was a team effort, with shared decision-making and everyone working hard to achieve the objective, the majority of the climbing, including the crux pitches, was led by either Astorga or Chase. 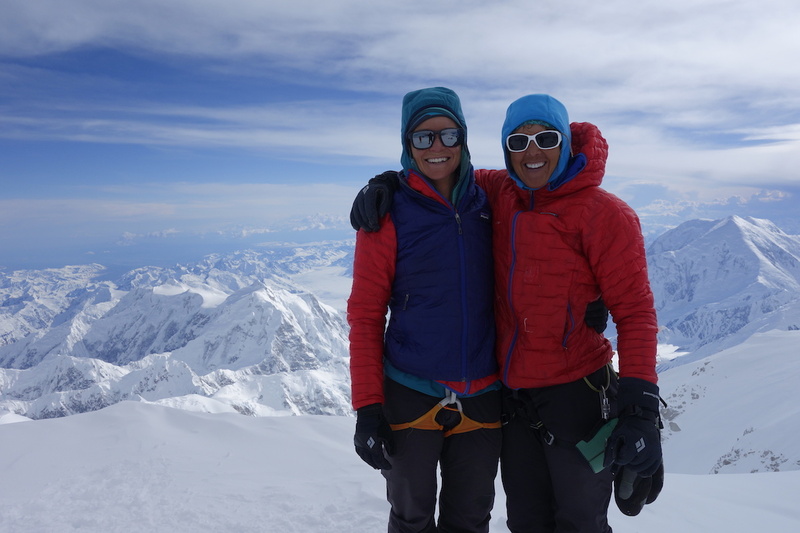 This ascent, and Astorga and Chase's recent landmark four-day ascent of the Slovak Direct on the south face of Denali (Alaskan 6, 5.9X M6 WI6+, 2750m), one of the most difficult and direct routes on the mountain, are representative of the increasing rise in the levels of female alpinism. We hope that their ascents will continue to inspire and encourage women alpinists, as they inspire us all. In the mountains he made two short new rock routes in Alaska's Ruth Gorge, and a remarkable series of climbs in Antarctica, where in the famous Fenris Kjeften Range of Queen Maud Land, Honnold reached the summits of 14 peaks by routes of varying difficulty. Notable was the east pillar (dubbed Dark Tower) of Stetind (2588m), climbed with Cedar Wright. Historians of Antarctic mountaineering feel this is probably the hardest on-sight, all free rock route on the continent. Climbed in cold, windy conditions, and with runout pitches on poor rock, it gave Honnold "the scariest lead of my life." That has to say something! Of course, all this was very much overshadowed by the astonishing free solo of Free Rider on El Capitan. On this sensibly well-choreographed ascent, Honnold exhibited complete mastery at a level probably unequalled in the history of rock climbing. Regular climbing partner Tommy Caldwell was convinced that in terms of mind control, it was "one of the pinnacle sporting moments of all time." But we shouldn't forget Alex Honnold's other commitment, on-going through 2017. The Honnold Foundation, founded in 2012, has the simple vision to improve lives and reduce environmental impact by working with partners to promote solar-powered energy worldwide. Last year, work continued with the Solar Energy Foundation (SEF) to carry out much needed installations in Ethiopian villages. This year, Andrej Stremfelj of Slovenia is receiving the Lifetime Achievement Piolet d'Or. The award acknowledges "a career where the spirit has inspired the following generations, in the sense of criteria set down by the convention," according to the Piolets d'Or website. Stremfelj and his partner Marko Prezelj received the first Piolet d'Or in 1992 for their 1991 alpine-style ascent of the south ridge to Kangchenjunga's south summit (8476m). This is the tenth Lifetime Piolet since the first was awarded to Walter Bonatti in 2009. Prezelj wrote a profile on Stremfelj that appears on the Piolets' webpage. ...There are countless women who have made hugely important and amazing climbs that have shaped alpinism and the world of climbing as we know it. [Alison Hargreaves, Catherine Destivelle, Lynn Hill, Sharon Wood and Wanda Rutkiewicz] are five women who should be considered for the Lifetime Achievement Award. Others include Alison Chadwick-Onyszkiewicz, Cathy O'Dowd, Lydia Bradey, Gertrude Bell, Annie Peck and Fanny Workman, just to name a few. The objective of the Piolets is always to celebrate what is great and good about alpinism in its purest form. The career award is presented to someone who has made an outstanding contribution to alpine climbing but is now past that stage of contribution (actually, we have a rough rule of thumb on age that a possible awardee needs to have reached in order to be considered). We bring them "to the stage" with their friends and contemporary climbers to celebrate their climbing career and inspire future generations. The Piolets have never made awards posthumously. To date, only two women have been associated with a climb that received a Piolet d'Or—Lise Billon and Kei Taniguchi, in 2016 and 2009, respectively. This year, in addition to the honorable mentions awarded to Chantel Astorga and Anne Gilbert Chase, of the 58 climbs included on the Piolets d'Or long list, there are at least five other female climbers who took part in different ascents: Maria Cardell, Galina Chibitok, Marina Kopteva, Dawa Yangzum Sherpa and Silvia Vidal. Christian Trommsdorff, a member of the Piolets d'Or Organizing Committee, said that moving the event to a new venue outside of France is the result of a few things, including general feedback from "several big names" and a proposal from Piotr Drozdz, who has been involved with the Piolets for several years and is the editor-in-chief of Poland's Gory Magazine. "In parallel, another reason is that public money is getting more and more scarce in France, and we want the [Piolets] to be a public, independent cultural event," Trommsdorff told Alpinist in an email. "Other locations around the world are also interested to host the [Piolets], so let's see what the future brings! In any case we are looking forward to a great festival and party in September in Ladek!" The Ladek festival includes films, presentations, clinics and discussion panels, including "a conversation on equality and the role of women in mountaineering and alpinism," according to a press release sent to Alpinist in an email. A full list of the 2017 ascents and links to stories about the climbs can be found here. Spirit of exploration: original (previously unclimbed) route and/or mountain, creative and innovative approach. Level of commitment and self-sufficiency. High level of technical ability required. Suitability of route in light of objective dangers. Efficient and sparing use of resources. Transparency regarding the use of these resources. Respect for people, climbing partners, members of other teams, porters and local agents. Respect for future generations of mountaineers by leaving them the possibility of enjoying the same kind of experiences and adventures.